In this post, we are presenting a quick checklist of numerous factors that are particularly important when it comes to choose a CMS. These days, most of people are turning to content management systems to update, manage, build and maintain a website more quickly. Presently, there are numerous open-source CMS are available in the market that offers great functionality and usability. However, making choice of right Content Management System (CMS) from such a diverse variety without pre-de?ned set of requirements can be bit tricky. 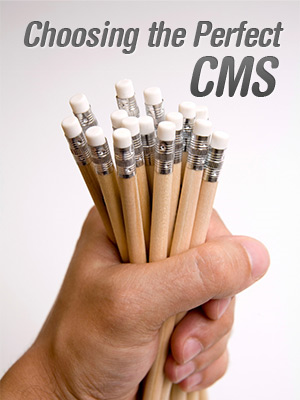 What are those factors that you need to consider while selecting right CMS? Below, we have put together all the important factors that you should keep in mind before choosing a Content Management System. Let’s have a look. Core functionality: Majority of people used to assume that CMS is an essential tool for creating, editing, deleting and organizing web pages. When most people think of content management, they take core functionality of a CMS for granted. Never forget to consider the basic functionality of a Content management system carefully. Never sacrifice the user experience for functionality. Search functionality: Approximately half of the online visitors’ get started on a web portal with the search of relevant content while browsing a website. At this end, “Search” in a website is the most important aspect that cannot be neglected at any cost. Multi-lingual support: In a multicultural society, you need a website that supports multiple languages to target every valuable visitor in the domestic market. Here, multilingual support comes into real picture. So, you should consider a Content Management System which comes with multilingual support. Supports permission and roles: As the number of contributors will grow and so, you need content management system (CMS) that supports different levels of permissions and multiple roles to ensure efficiency and consistency. The editor: In the checklist, another core feature is the WYSIWYG editor that worth importance when it comes to perfect content management systems. The editor is the most important feature of a CMS that allow content providers to make to edit, modify, manage and update web content along with basic formatting without any hassle. Customization: A good CMS must provide great functionality; easy-to-use and highly customizable .It seems that the complete flexibility led to great accessibility make a Content Management system stand out boldly. Multiple website support: The multiple website support is the must-have feature in a content management system that helps in running multiple websites from the same installation. Management of assets: The poor accessibility and usability of a CMS can really irritate the user of a system. Bad management of assets particularly images can cause unmanageable problems and therefore, it is advisable to choose a CMS that allow content providers to add <alt> attributes to images. A CMS should be featured with basic image editing tools that can be used to crop, resize and rotate the images. We hope that all the above discussed factors will help you in buying right CMs best suits to your requirements. It is advisable to choose your perfect Content Management system by keep your eye on the upcoming web development trends. Therefore, you should always check your list of requirement and ask yourself what you are looking for in a Content Management System (CMS) before making a purchase. Keep an open mind and do enough research on different aspects of CMS before making a purchase.